Naija End Gooner: The Euros is Over and Arsenal is Still Here! Welcome to a brand new week and the beginning of the second half of the year. 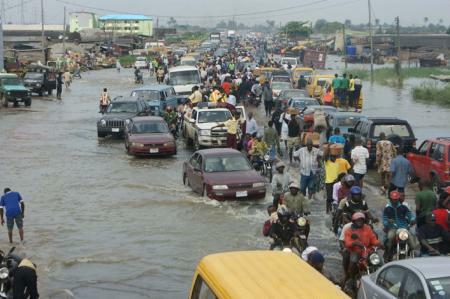 The rains continue to pound down on Lagos and a few surrounding states. Last Friday, many residents of Lagos woke up to find their homes submerged in flood waters after several hours of a consistent downpour that had begun in the early hours. It's a nightmare to move from one end of the city to another as the persistent rains continue to cause traffic gridlocks. The state government has warned residents to expect the rains to continue like this for the next two weeks. Scary news. The good new is that the proposed rehabilitation of the 3rd Mainland Bridge has been suspended indefinitely by the Federal Government. The bridge was scheduled for partial shut down on the first of July for five months to enable repair works on sections of the bridge. Lagos residents had been worried about the implications of closing the bridge to commuters with memories of the chaos that resulted in 2008 when the bridge was partially closed for repair works still fresh on many minds. Phew! In football, Spain comprehensively trounced Italy 4-0 in the finals of Euro 2012 on Sunday evening. Though my money (and most smart monies) was on Spain, nothing prepared me for the total annihilation of Italy considering that they had gotten to the finals by playing a solid, attacking style that is atypical and had won them many fans. Not a few people thought they will go on to beat Spain in the finals. Italy's new-found attacking, free-flowing approach proved to have flattered to deceive in one of the most open finals of a major tournament as Spain showed them they are still the masters of the passing game. To be fair to Italy, the stretchering off of Thiago Mottta after pulling a hamstring within five minutes of coming on as the third and final substitute didn't do their cause much good as this ensured they had to play the last thirty minutes with 10 men. They were already two goals behind but any chance of a fight back against an unrestrained Spanish team that was clearly in the mood was lost when the Spaniards got superiority in numbers too. For a side that had received criticism earlier in the tournament for in-fighting and sacrificing the essentials of their attractive possession game for a more practical dour style, the Spaniards could not have displayed better team play and their now famous tika-taka style was at its best on the night. Even our very own Arsene Wenger would have wished he had put a sock in his mouth when he accused Spain of betraying their philosophy when questioned by media people before the game. "They have betrayed their philosophy and turned it into something more negative.Originally they wanted possession in order to attack and win the game; now it seems to be first and foremost a way not to lose," Wenger said. The Spaniards were worthy winners in the end as the completed a hat-trick of wins in consecutive major tournaments, becoming the first team to do so. Before I wrap up on the Euros, honourable mention has to be made of Spain's left back, Jordi Alba who will be joining Barcelona from Valencia in a 14 million Euros transfer next season. Spain's second goal came from his left boot after a magnificent run led to his latching unto a perfectly weighted pass from Xavi and then proceeded to slot pass a hapless Buffon. His performance on the night was commendable; Barca seem to have found the perfect replacement for Abidal. Now that the Euros are over, I cringe at the thought that it will be another month and half before the leagues resume leaving only talk of football to provide the fix that most football lovers crave. The Super Eagles coach has confirmed that home based players will be used for the game against Arsenal on August 5th in Abuja. I'd received this news with trepidation when I heard it for fear that the game may not provide the spectacle that fans will want to see as well as the fear that some over-enthusiastic home-based player may break someone's leg before the game is completed. On second thoughts, I think Nigeria as a top footballing nation will be letting herself down by playing a club side even if that club side happens to be my darling Arsenal. Either a game is arranged between one of the league's top side (Rangers if I were to choose) or a collection of outstanding players from the local league that will be named "Nigerian 11". On the business side, rumours have emerged that we are in pursuit of Fulham's American forward Clint Dempsey further fueling the rumours that RVP is on his way out. Dempsey isn't a player that particularly excites me but when you add that to the much business we have done so far I must that we are looking like a team with intent for the first time in years. While we have not waited till the last two days of the transfer window to bring in players, we have also not concentrated on 15 and 16 year olds that will be groomed for three years before letting them go to richer clubs and pocketing the proceeds. Mancini of Manshitty has distanced himself from any rumour linking RVP to Manshitty in an interview with The Sun. The Italian media have also reported that Arsenal has rejected an 8 million Euro bid from Juventus as well. Is that how much they think of him? Cheeky if you ask me. While I'll loath to see him go, I think RVP's contract needs to be tidied up within this week so we can begin to prepare for next season and possibly life after him. The first of our pre-season games is on the 14th of July and we need to start early to identify the shape and form of the team that will be prosecuting the campaign next season. Besides that, he is our captain and the present situation can affect those he leads in no small measure. The latest news from Wilshere's hospital bed is that he will be missing the start of the campaign; the earliest he will be fit to play will be mid-September. This is a player we have clearly missed in the middle of the park and I do hope he will be the same player he was before the injury when he does return. There's so much talk now of his being England's next messiah these days and I do hope the pressure will not get to him. Having said that, I think England ought to be looking for more players than one as they look to become world beaters in the near future. It usually takes a lot more than one player to become champions. Manuel Almunia has been released by the club with four other young players whose names (other than Gavin Hoyte) will not ring any bells after their contracts expired on June 30th. I should shout a loud hurray but of course it's bad joss to gloat over the misfortunes of other so I'll wish him well in all future endeavours. Chelsea are in hot pursuit of Inter Milan's Maicon in their search for a right back after Bosingwa's departure. Personally, I couldn't be less bothered; I think Maicon hasn't been the same since Gareth Bale demystified him in the Champions League a couple of season's ago. I'll say they're welcome to him. United are in pursuit of Everton's Leighton Banes in a reported 15 million pounds deal. Now that's a man I'll not mind having to man the left back position at the Emirates. Don't see Everton saying no to that much money and of course it's only in my dreams that we can start a bidding war with United. Alright, I have to go now. Have to go across town and my canoe has arrived. See ya! 8m for RVP? thats a joke, innit? Hehehe. Thats probably what he was worth before Euro2012. He did not raise his value there.